A week ago, Oaklandsocialist wrote an article on how Ironworkers Local 86 was supporting Amazon against the homeless in Seattle. We sent it to Chris McClain, business manager of Ironworkers Local 86. We received the letter below from McClain – or at least we assume it was from him. It’s not signed, but it came from his e mail address. Most of the reply is a long “rags-to-riches” tale by McClain. This is the typical kind of thing that the capitalists themselves like to talk about. “Anybody who works hard and applies themselves can make it in America,” is the moral. So, before McClain took the side of Amazon and Corporate America in practice. Now, he’s doing it in the realm of ideas. 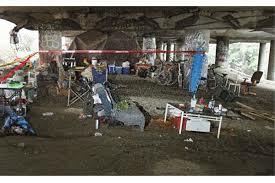 Whose side will labor be on – the unhoused in Seattle..
Sure, there are people with all sorts of problems who are homeless, including substance abuse. But the building trades unions aren’t exactly in a position to condemn people who have drinking problems, considering the situation of our very own members! Substance abuse is not the cause of homelessness. Nor is laziness. Poverty – meaning low wages and high housing costs – is the basic problem. And what McClain & Co. are doing is simply taking the position of Corporate America and blaming the victims. 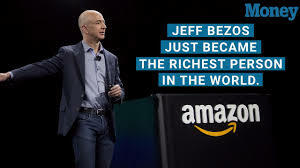 or the likes of Jeff Bezos, who’s the world’s richest man at $100 billion. Behind this is the whole strategy of the entire union leadership. That strategy is to help “their” employers make a secure profit. It’s to team up with “their” employers against the non-union employers, to help them compete against the non-union employers. In the building trades this is called helping “our” contractors compete with the non-union. It means holding down the wages and working conditions. The results are substandard contracts, exactly like the one the Carpenters Union leadership is peddling right now in the Seattle area. It’s why the Carpenters in the Pacific Northwest gave up on the union pension plan. Basically, this entire strategy is the “race to the bottom.” Keep wages low and taxes (on Corporate America) lower so that we can have jobs. What will union workers say when some other city offers Amazon an even sweeter deal – no taxes (including property taxes) at all for 15 years, plus a union free environment? That’s where all this is headed after all. McClain writes “We know that prosperity has many side effects. To include homelessness.” In other words, the prosperity of some means the increased suffering of others. Where will this lead? 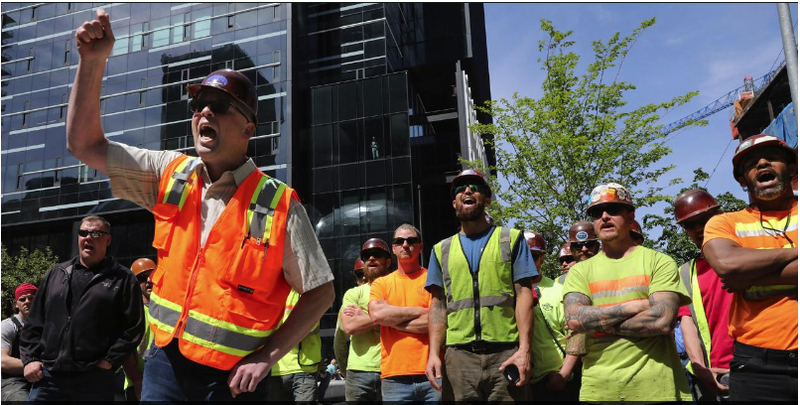 Added on 6/16: Since this article was published, we have been told about the growth of non-union construction in Seattle. Specifically Chinn Construction, which has huge jobs that make up an city block. This is a graphic example of the failings of this strategy in Seattle itself. McClain implies that what we’re saying is that labor has to have “an all or nothing tactic”. No, that’s not it at all. What we’re saying is that if we are to be the slaves of the financiers (as the secretary treasurer of the Alameda County Building and Construction Traces Council put it), then let’s be the Nat Turner slaves, not the house slaves. Let’s not try to get the best deal for ourselves under slavery while betraying the field slaves; let’s try to organize a rebellion for all slaves. Instead of demonstrating to boost the profits of one of the richest companies in the world – Amazon – building trades workers should be organizing to picket Amazon all across the country as a way of pressuring them to pay up. 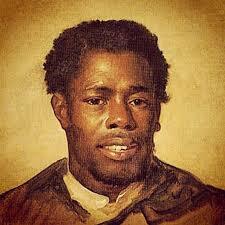 Artist rendering of the great Nat Turner. Let’s be the Nat Turner slaves, not the house slaves! We are on the side of Labor. We protested the one person that has protested every project and proposed project over the last few years. To include projects outside their purview. We use these projects to organize the most under represented members in our community and our diversity numbers prove it. We are on the side of sanity. No work, no prosperity. I started life poor. Even spending some of my early years being homeless when my parents struggled. I thought we were just “camping” in the car but as an adult I know the truth. I even spent time in my late teens being homeless but due to the assistance of others and the grace of God I overcame those difficulties and graduated high school. My whole life I have enjoyed being busy doing something I enjoy, with people I care about and call family. Sometimes we disagree. However, we always work things through. Professionally. The Ironworkers give people chances. If you can work hard and show up everyday, on time we may have spot for you. We do tryouts. They last a month and we can only take folks in when there is a building boom. We have a very diverse membership. But we all have one thing in common. A strong work ethic. Our memories are long. It wasn’t so long ago we were suffering. We didn’t have jobs, or money. My friends and family members lost or were losing their properties. Which most use as a form of retirement. History repeats itself but not exactly. Strategic recollection of funds through collective bargaining and strong contract negotiation has proven to be more successful than sitting on the sidelines protesting for attention. With all this innovation and growth and prosperity sometimes I feel like we are the smartest people in the world and we have great opportunity to use that knowledge to gain better wages and benefits. Most people seem to be in favor of that. And if we can begin to stabilize our economy in approximate relation to our population increases then we can discuss how to help what seems to be the most helpless of our society. With a stable plan. According to history we have always had homeless populations. And that they increase when a region is prosperous. History also shows that proper planning allows for clear long term plans. A lot of us started our Ironwork careers living in Seattle. I lived in Magnolia. Didn’t need a car, gas and insurance to get to work. As I got older we wanted a yard so we moved out of the city to buy a house for the same as our rent but then I needed car, gas and insurance. We didn’t have this amazing light rail. Do I think there atrocities in the world? Yes. Do I think that negotiating an all or nothing tactic to a responsible developer is a successful or realistic idea? No. You want some money from Amazon? Use the $195 million dollars annually at your disposal to show that you have come up with a realistic and sustainable facility that house and treat whatever ailments they are facing. Even if it only addresses 10% of the current issue. With a successful example in hand you can ask our wealthiest societal members to invest in your plan. They may or may not help. But you will have done much more than what we see now. And you may plant a seed. We will support any successful idea for a solution. We will not support an action that risks the growth and prosperity of employed members of society. Our jobs, like most of the private industry is based on competition and are not guaranteed to be Union. We earn living wages with healthcare and retirement benefits. If we aren’t building roads, bridges and buildings our population will outgrow the ability to meet their needs. That can be witnessed in day to day traffic currently. We are professional Ironworkers. Union Ironworkers. Value on display, every day! Let us work!